There is an eerily similar feel to this Terrelle Pryor situation. The constant lack of info from proper sources...fueling speculation from improper sources like me, is starting to grow thin. While I certainly have no insider info to shed on this topic, it certainly doesn't stop me from being curious and eager to find out what the hell is going on in this kid's head. A Detroit Free Press article today, for the most part further speculates what most of us already know: Pryor has 3 weeks left to decide, he might want to play basketball, and he wants to go to Ohio State, Michigan, Penn State or Oregon. What the article did tell us is that Pryor wants his mom to visit all 4 schools with him. He admits that Oregon may be out of the question due to distance and time, but he wants to do a full 2 day visit to Penn State, and a one day trip each to Columbus and Ann Arbor. Apparently, he's no closer to a decision than he ever was. He admitted to being close to choosing Ohio State prior to signing day, but decided not to due to his father's urging to look at Penn State. But now that he seems so "up in the air" about where he wants to go...anything less than a signature on a faxed letter would be seemingly irrelevant. Clearly, I have no idea. But in keeping with my effort to fill these "pages" with actual content and not just embedded YouTube videos...this is the best I can do. 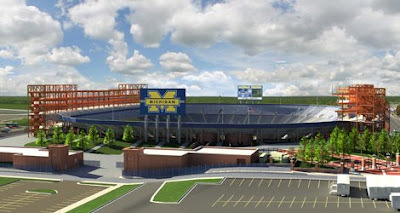 On a side note, the athletic department released a computer rendering of what the Big House should look like come fall when the season starts. I have to admit, it will be kinda cool seeing those huge steel structures looming over the side of the stadium this fall. I think this addition will be just awesome when it is completed in 2010. Wider seats (thank you very much) and hand rails will be a welcome sight in the cramped Big House. As will added bathrooms, a better concourse and more concessions. Now if they could just add a Grizzly Peak pub in every corner of the stadium concourse, I'll put all those new bathrooms to good use!